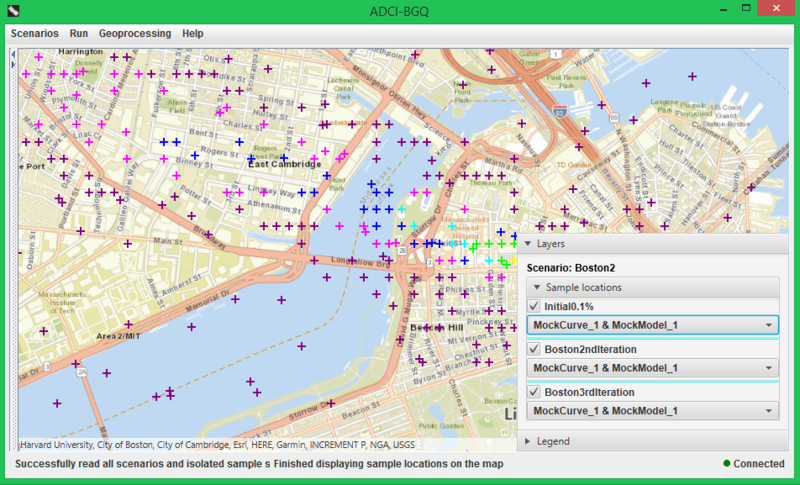 In one iteration (see the overall workflow), after processing the current sample set and performing dose estimation, the next step is to display the geographic locations and ADCI-estimated doses of all samples contained in all sample sets of the scenario. To achieve this, first select the scenario in the scenario tree, then click the ‘Display sample locations’ menu item under the ‘Geoprocessing’ menu. A dialog showing the progress of retrieving the coordinates and estimated doses of all samples contained in all sample sets will pop up. If you decide not to display the scenario on a map any more, you can click the 'Cancel' button. Since in previous iterations this step has been executed, the local cache files storing sample coordinates and doses of previous sample sets already exist, so that they will be directly used and only the sample coordinates and doses of the current sample set need to be downloaded. The only exception is that if you changed descriptions of a previous sample set, its cache files would become obsolete. A cache file will also be created for the current sample set after finishing downloading its sample coordinates and doses, to expedite this step in the next iteration. After the retrieving process finishes, a world map will be displayed in the right panel. You can zoom in to the geographical area where the nuclear scenario occurred. You can also click the small arrow on the top of the bar separating the left sample set tree and the right panel to maximize the map. The following figure shows that the location of a sample (or person) is denoted by a cross on the map. The colors of the crosses, which are explained by the legend in the bottom-right corner, represent the dose values of the samples. The following figure indicates that in the bottom-right control every sample set in the scenario corresponds to a checkbox and a drop-down list. 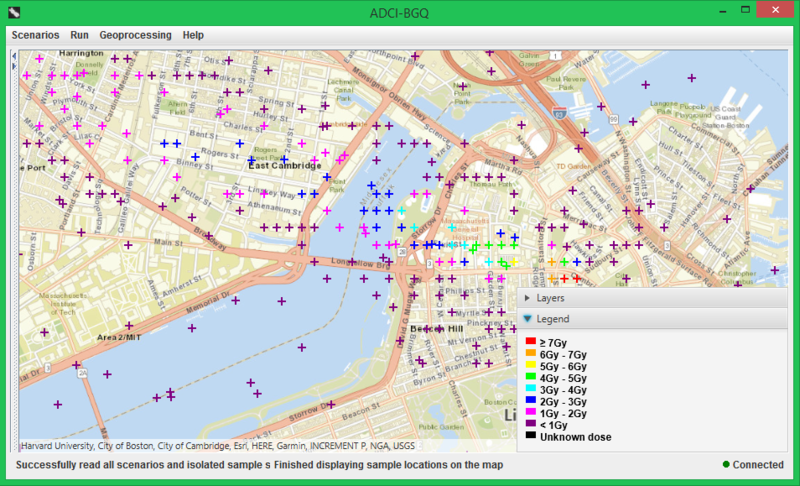 You can also hide the sample locations of a sample set from the map by deselecting its checkbox. Since the doses of a sample set can be estimated with multiple curves/image selection models, its drop-down list contains all dose versions (i.e. all combinations of curves and image selection models under which the doses of the sample set were estimated). You can display another dose version by selecting another item in the drop-down list.